Despite being snubbed by opponents and officials alike, the athletes won five medals and treated the tournament and their opponents with respect. Moshe Ponte, the president of the Israel Judo Association, said the team was guided by the Japanese meaning of the word “judo” itself: the “gentle way,” or using the strength of one’s opponents against them. But if you don’t think that sounds like the Israeli way, you’re not alone. Regev was referring to Abu Dhabi’s ban of Israeli symbols at the tournament. The Israeli flag did not appear during medal ceremonies, and the national anthem was not played for Israel’s gold medalist. Israel and the United Arab Emirates do not have relations. The news of Israelis racking up medals at the tournament — and videos either of their opponents scurrying away during the handshakes or of one Israeli winner plaintively singing the words of Israel’s national anthem despite the ban — set off torrents of Israeli pride and indignation. And in Israel, it set off a debate: Should its athletes stay away from tournaments in regions where they are sure to be snubbed, or take part and try to eij recognition on the mat? Throughout the UAE tournment, the Israeli athletes quietly found ways to highlight their national identity. 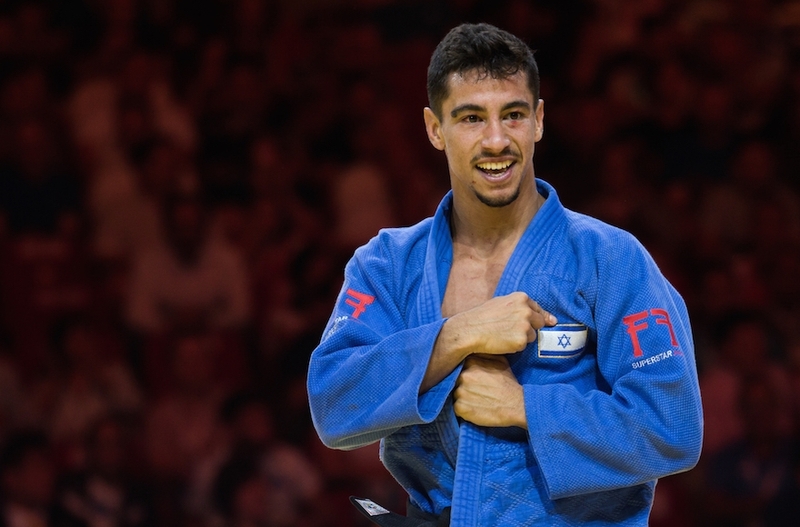 Tal Flicker, who won gold Thursday in the men’s under-66 kilogram category, sang the Israeli anthem “Hatikva” while the International Judo Federation’s anthem played in the hall. The federation’s flag, not Israel’s, hung above him. After winning the bronze medal in the over 100-kilogram category, Israel’s Or Sasson, who also won bronze at the Rio Olympics, pointed to the bare patch on his uniform where the competitors from other countries had their national flag. At the end of at least two matches, athletes from Arab countries, one from Morocco and the other from the United Arab Emirates, refused the outstretched hands of the Israelis who defeated them. One of the Israelis, Tohar Butul, went on to win bronze in the men’s lightweight category. Moshe Ponte, the president of the Israel Judo Association, said he and his team take pride in representing Israel. But first, he said, they are athletes, which is why he agreed to go to the tournament even knowing the limitations that would be put on his team. He said Regev, a fervent nationalist from Prime Minister Benjamin Netanyahu’s’ Likud party, left the decision to him, but she chose not to accompany the team once Abu Dhabi’s conditions became clear. In Israel, some second-guessed Ponte’s decision. Itzik Shaso, a columnist for Israel’s popular Yediot Aharonot newspaper, on Sunday outlined the divide in public opinion between the “patriots,” who support boycotting the tournament, and the “pragmatists,” who are displeased with the conditions but welcome the chance to make a statement on the mat. “According to [the patriots], the elevator music that played instead of the anthem for gold medal-winner Tal Flicker was indeed embarrassing, and the [federation] flag on the athletes’ backs indeed looked like some scribblings, but if they are letting us slam some goyim on the mat without the United Nations condemning it, wouldn’t it be a shame to waste the opportunity?” Shaso wrote. “Goyim” is a somewhat derogatory word for non-Jews. Regev acknowledged both camps when she greeted the team on its return Sunday night to Ben-Gurion Airport, where she waved the Israeli flag and sang “Hatikva” with the team. She said once Ponte decided to go to the tournament, she demanded he bring home medals. Similarly, Deputy Foreign Minister Tzipi Hotovely said that her ministry had not been involved in negotiations over the tournament given Israel’s lack of diplomatic relations with Abu Dhabi. But she nonetheless touted the team’s participation as a sign of Israeli power. Writing for Israel’s Walla! Sport website Saturday, reporter Yaniv Tuchman accused his fellow Israelis of enjoying being the victims a little too much. While righteous outrage may be good politics, the judo team’s performance in Abu Dhabi seemed to produce results. On Saturday, the United Arab Emirates’ top judo official publicly apologized to Ponte for the refusal by his athlete to shake his Israeli competitor’s hand. Ponte said the same official privately promised to do what he could to make sure the team could display its flag and hear its national anthem next year. Ponte said the team, overall, was treated very well by its hosts. By comparison, last time Israel competed in the Abu Dhabi Grand Slam, in 2015, Ponte said, no one even shook his hand. He attributed the change at least in part to what happened on the mat. The team won three more medals this year than last time, and the gold forced the anthem issue. Ponte said he hoped Abu Dhabi would change its rules next year as promised. But he said regardless, Israel would be at the competition gathering points to qualify for the 2020 Olympic Games.